Emmanuel Macron became France’s youngest ever president yesterday (14 May), promising at his inauguration to restore the country’s lost confidence and relaunch the flagging European Union. Macron, a 39-year-old centrist, took the reins of power from Socialist François Hollande at the Élysée Palace a week after his resounding victory over far-right leader Marine Le Pen in an election that was watched worldwide. After a private meeting with his former mentor Hollande and his first speech as president, Macron headed up the rainy Champs Élysées in an army vehicle, waving to small crowds of wellwishers who gathered along the famed avenue. Macron said his first priority would be “to give back to the French people the confidence that for too long has been flagging”. Macron pledges a France that "spreaks out loudly for freedom and solidarity." “I will convince our compatriots that France’s power is not in decline, but that we are at the dawn of an extraordinary renaissance because we have all the qualities which will make… the great powers of the 21st century,” he said. While France’s place was in the European Union, “which protects us and enables us to project our values in the world”, the 28-member bloc needed to be “reformed and relaunched”, the president said. 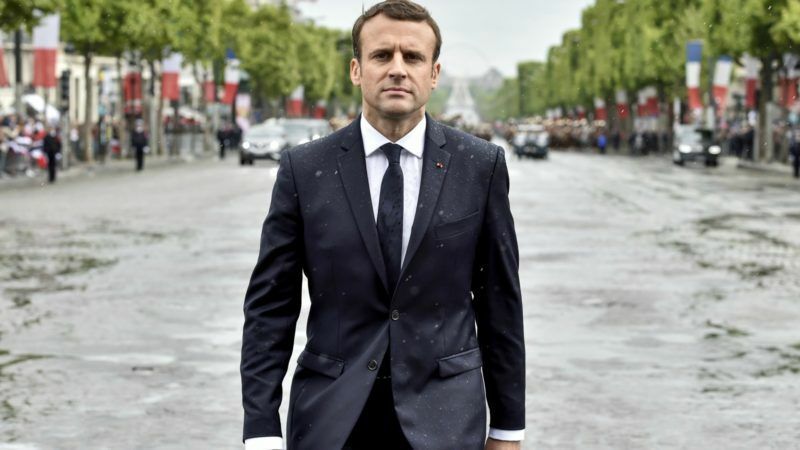 Macron also suggested he would press on with his ambitious agenda to reform France’s rigid labour market and modernise the social security system despite the fierce resistance he is likely to meet. 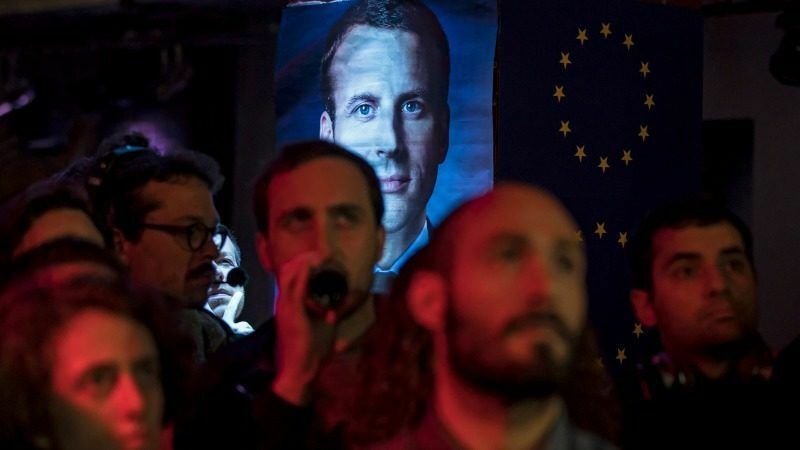 Some analysts and opponents have questioned the strength of Macron’s mandate after he won just 24.01% in the first round of the presidential election on 23 April before his landslide victory over Le Pen in the second. His rivals on the far-right and far-left, opposed to the EU and major economic reforms, won around 50% of the first-round vote. A man of his time? The former investment banker was proclaimed president by Laurent Fabius, president of the Constitutional Council, at the 18th-century presidential palace in central Paris where Macron and his wife Brigitte will now live. Brigitte, a 64-year-old who was his high school drama teacher, wore a light blue Louis Vuitton outfit for the ceremony. Her three children from her previous marriage were also present along with VIPs from France’s political scene and the young team of advisors behind Macron’s sensational rise. Security was tight, with around 1,500 police officers deployed near the presidential palace and on the Champs Élysées, and surrounding roads blocked off. At the end of the formalities, a 21-gun salute rang out from the Invalides military hospital on the other side of the River Seine. Macron then headed to a hospital outside Paris where soldiers wounded in military operations are treated. He later visited the capital’s town hall for the traditional visit made by each new president to his “host city”. There he promised to “campaign fully” in the bid by Paris to host the 2024 Olympics, which he said was exactly the kind of event to boost national optimism. “The challenge of the next five years will be to prevent our country from falling apart,” he said. The new president faces a host of daunting challenges including tackling stubbornly high unemployment, fighting Islamist-inspired violence and healing divisions exposed by an often vicious election campaign. Hollande’s five years in power were plagued by a sluggish economy and bloody terror attacks that killed more than 230 people. He leaves office after a single term. Macron’s first week will be busy. Today, he will name his prime minister, rumoured to be Edouard Philippe, a conservative MP and mayor of the northern port city of Le Havre. Macron will then fly to Berlin to meet German Chancellor Angela Merkel, maintaining a French presidential tradition of making the first European trip to the other half of the EU’s power couple. The new French leader wants to push for closer cooperation to help the bloc overcome the imminent departure of Britain. He also intends to press for the creation of a parliament and budget for the eurozone. Merkel welcomed Macron’s victory over Le Pen, saying he carried “the hopes of millions of French people and also many in Germany and across Europe”. Further ahead, Macron will need to win a majority in parliamentary elections in June to enact his ambitious reform agenda. His 13-month-old political movement “République en Marche” (Republic on the Move, REM) intends to field candidates in virtually every constituency in the country. Emmanuel Macron’s start-up political party on Thursday (11 May) announced a list of 428 candidates for French parliamentary elections in June, a move likely to shake up French politics. In Brussels, the liberal ALDE group hopes En Marche! will join its ranks. It unveiled 428 of its 577 candidates this week. Half have never held elected office, including a retired female bullfighter and a star mathematician, and half are women.